the option to power their cars on sunshine instead of traditional fossil fuels.The purchase of an electric car that plugs into the power grid to recharge its battery often gets drivers thinking about the source of their energy and installing their own electric vehicle charging station. 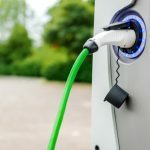 If you own an electric vehicle such as Tesla or Nissan Leaf and you’d like the convenience and safety offered by an at-home electric vehicle charging station–talk to the electrical experts at Pinnacle Roofing Professionals. We’re happy to answer any questions you may have. We install a vast selection of the most advanced, fully featured residential electric vehicle charging stations available along with professional installation and service. Call 206.919.3538 or click here to schedule your free estimate today.